The Colony is the redevelopment of a prominent 27 acre site located on the southwest quadrant of Sharon Road and Colony Road in the center of the South Park area of Charlotte. The mixed-use development included 250,000 SF of office space, 300,000 SF of retail space, 990 apartments, and a 175-room hotel. DRG provided a detailed Traffic Impact Analysis (TIA) for the mixed-use redevelopment. 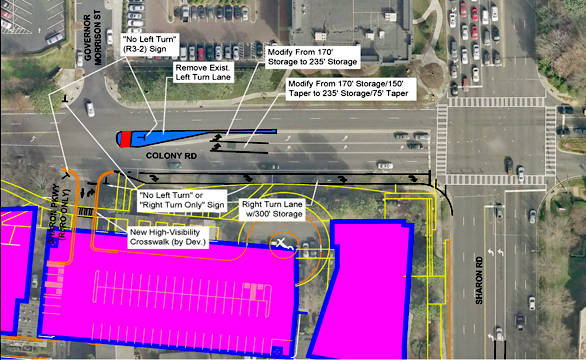 Conceptual drawings detailing the recommended mitigation which included an innovative signalized directional-crossover on Sharon Road to allow for the protected movements of both vehicles and pedestrians were provided.